Roald Dahls 1964 classic is as relevant for children and parents today as it was when it first came out. The story follows Charlie Bucket, a poor boy who lives with his parents and all four grandparents in a small and broken down house outside of town. Charlie, like so many other children, loves candy, but can rarely afford the treats. When the chocolatier Willy Wonka announces a world wide lottery, where he has placed 5 Golden Tickets in five chocolate bars, Charlie hardly even dreams of being a winner. And yet, the final Golden Ticket comes to Charlie in a pure miracle, when he finds a coin on the street and decides to buy a small chocolate bar for him self and give the change to his mother, so she can buy food for the family. Now that we have met the children, lets take a look at their host and tourguide Willy Wonka. It is safe to say, that the man is mad, in an absolutely bonkers kind of way. But he is fun, friendly, inventive and a very successful businessman. On his factory he has no human employees, but a whole army of small human like “Oompa Loompas”, who receive their payment in chocolate. I will not review the tour of the factory, for the inventions of Roald Dahl and Willy Wonka are a ‘must read’, but I will have a look at the destiny that befalls the children. As the tour progresses and the wonders of the factory unfolds before them, their worst personality traits become their downfall. Augustus Gloop falls into a river of chocolate and is pumped up and out by the pipes, Veruca Salt (and her parents) are pushed down the garbage shoot by a group of nut cracking squirrels, Violet Beuregarde is turned into a juicy berry by chewing a prototype gum and Mike Tehveh gets televised and becomes toy sized. Being the only child with no bad personality traits to overcome him, Willy Wonka announces that Charlie Bucket has won the competition and becomes the heir to the Chocolate Factory. The morale of the story is clear: people get what they deserve. All children were warned by Willy Wonka before they met their misfortunes and their troubles could have been avoided, if they had listened to him done as they were told. While Augustus Gloop and Veruca Salt are brats with a strong lack of discipline in their lives, neither Violet Beuregarde nor Mike Tehveh are victims of bad parenting in the same way. They just have bad habits. The voice of reason in the story is actually Mike Tehveh, but whenever he points out, that Willy Wonka says something which is highly untrue, Willy Wonka is actually a bit rude and claims that Mike mumbles and can’t be heard. Rather than learning lessons and bettering their ways, all four children and their respective parents are merely punished. This is not new in good vs evil stories, for instance, in the classic fairytale Cinderella, the stepsisters both get their eyes ripped out by birds and the stepmother is forced to dance in burning hot metal shoes. There are no grey areas when a point needs to get across. And the four unfortunate children all get to go home with a lifetime supply of chocolate by the end of the day. Thanks to Willy Wonkas inventions, they are all returned and almost to their natural state. Augustus has been sucked thin, Veruca and her parents are covered in garbage, Violet has a permanent skincolor of violet and Mike has been stretched to an elastic version of his former self. “Charlie and the Chocolate Factory” is a fantastic story to read alone as a child (of all ages) or reading it out loud to ones children. It is funny, adventurous and has a morale despite the madness and overindulgence of sugar. It is also noteworthy, that the book has been adapted into a movie twice. And in both versions, the filmmakers has added their own twists to the story, in order to make another point of morale. In the 1971 version, Charlie is not as innocent as in the book, and ends up floating under the ceiling from an elevating soft drink. The drink is mentioned in the book, but in the film a point is made, that even Charlie the good child, can’t resist going against the rules. 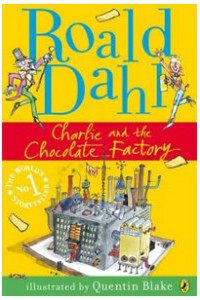 In the 2005 version, a backstory is given to Willy Wonka, to explain some of his madness and his obsession over chocolate in the form of a father, who is a candy disapproving dentist. And where the book-Wonka invites the entire Bucket family to come live at the factory and help Charlie run it, the 2005 movie-Wonka wants Charlie to leave his family and move in with him. Charlie declines, as he would rather have his family than a billion dollar chocolate factory. In the end, they compromise and Charlie reunites Wonka with his father. Biggest morale of the story? Parents should make sure, that children have quality over quantity!